Yesterday, di-di & I caught the stage show version of 'The very hungry caterpillar & other stories' at Victoria Theatre. I was so excited about it! Just like the 'Rainbow Fish' show which we saw a while back, this show also uses UV Light or Black Light so as to make the puppets glow and come alive on stage. I was so anxious in waiting for the show to start that I couldn't help but nibble on the apple. An added bonus was after the show, the puppeteers all came onto the stage to field questions from the audience, and also to show us how they moved the puppets. Really cool! Then it was the story of 'The Mixed-up Chameleon'. 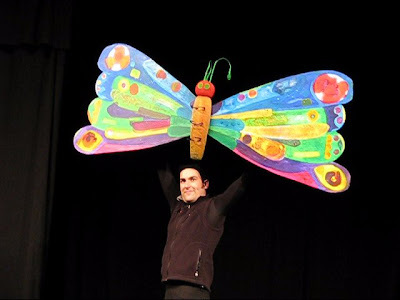 The final story that has got to be the crowd's favourite was 'The Very Hungry Caterpillar' of course. And the butterfly in its full glory! All 3 stories dealt with a common theme - Change. The little cloud and its different shapes & sizes; the chameleon and it's different colours; and the change of forms that the caterpillar underwent. Enjoyed reading your travel entries!